The big brothers have been outside all morning with Grampa and Dad, stacking firewood for dear Grandy Fonda who lives next door and then shooting bb guns at popcans on fenceposts. They could be out there all day and never complain. Soon enough we'll call them in to wash up and look sharp for some family photos. They'll humor me, I hope. Mark fell asleep in my arms just before Santa made his grand finale appearance in the Macy's Parade. Meanwhile, Mom's got the pumpkin pies cooling on the table and two five-pound turkey breasts roasting their hides and insides in (my) happy anticipation of our Thanksgiving feast. I just finished making myself a tide-me-over grilled cheese in the butter, onion, and celery drippings from the stuffin' prep--my just desserts for choppin' that glad-I-hadn't-yet-put-mascara-on, cryin' onion. So I'm sitting down to write at one end of the great farmhouse table, two extra leaves added in, sipping my coffee and munchin' on that stuffin'-seasoned grilled cheese sandwich. Mom's writing, too, at the other end--how she made her stuffing this year. We're like that, the women in this family, frequently changing it up yet wanting to remember the progress of our recipes. Soon enough the table will be spread with all the colors of autumn--gold, orange, red. I laugh because Mom says, "Thanksgiving's an orange holiday. I don't do green beans for Thanksgiving." There will be plenty without them, and I'm sure my boys won't complain at her color logic. In fact, they'll probably try to use it to skip out on green beans all through Fall, though it won't work since green's a favorite color of mine. Really, I just wanted to give you a glimpse into our family's lives and wish you a "Happy Thanksgiving!" I hope you're able to spend some extra time today thanking God for His faithfulness throughout this past year, for His grace that has sustained you and yours through even the hardest of times--that is sustaining you still--and for the hope of eternity with Him. After all, there's an even greater feast coming: the wedding feast of our Savior and His Bride, the Church. As much as I'm looking forward to the golden turkey, cranberry, and dressing, the mashed potatoes and sweet potatoes, and the pie in a couple of hours, I'd gladly pass it all up if that trumpet blew and the clouds parted and Jesus Christ returned to gather us round His table at Home. Oh, what thanksgiving we shall share in that Great Day A-comin'. Until then, let us be faithful in giving thanks, always rejoicing in His goodness to us. I should be sleeping. But there must have been caffeine in that cup of Orange Pekoe that I drank at Women for Missions tonight. The tabs are open at the top of my screen for Fox News & The New York Times. But we'll know soon enough the fate of our nation. For now, I'm choosing to pray for those preaching the gospel in our nation and for those who need to respond to that truth. I lined my bread pan with wax paper, sprayed it with a bit of oil. Baked at 350F for a little under an hour so that it was done but still moist. And slid this bread straight from the pan to a plate sprinkled with cinnamon sugar. A few roasted pumpkin seeds and some extra raisins for presentation. And voila! Bon appetit! I think you're going to love the way this hearty, (mostly) healthy harvest pumpkin bread turn out. And regardless of the election results, rest assured, our God reigns! Sometimes fiction fleshes out the facts so that it all becomes more real. That's certainly true of Ann Rinaldi's historical fiction. And, she tells you which is which in the Author's Note at the end of the book: it's true that ... which led me to imagine that .... I love that! From sibling rivalry to first love, the horrid conditions of the prisons to the only alternative (in that day) of confining Mrs. Henry to a basement apartment. Rinaldi paints the gripping tragedy of the Henry family as they lose their wife/mother to mental illness. Nowadays, things may have turned out much different. But then, it was laudanum and confinement. Mrs. Henry dies shortly before Patrick Henry's famous "Give Me Liberty or Give Me Death" speech, and Rinaldi wonders, did he borrow the line from his wife, who upon not receiving liberty from her straightdress found her only relief in death. There are warm spots, but it's not what I'd call a "fun" read. However, knowing the biblical pronouncement that "it is better to go to a funeral than a party," I highly recommend this book as an introduction to a time period and a sober rending of one family's reality. Again, this one gave an eye-opening accounting of the sickening reality of slavery, starting with Phillis (named after the ship she was transported to America on) witnessing the horrors of the passage. Pampered throughout her time in Boston, Phillis is educated and given every encouragement as she begins to write. She would become famous, and yet the author wonders, by pampering her during her years as a slave, did they adequately prepare her for life on her own? Have you ever wondered the same about present generations: does the pampering not really pay off? I wish Rinaldi had included a few of Wheatley's poem, just for authenticity. But I thoroughly enjoyed being acquainted (again) with a time period and unique cast of characters. Keep Ann Rinaldi on your radar. These may not be new releases, but as introductions to historical time periods, places, and people, these are timeless works worth reading. I'd like to share with you one of the most encouraging resources I've read dealing with "help & healing for those grieving pregnancy loss or early childhood death" (as the subtitle reads). My dear friend, and our church's Women's Ministry Director, shared it with me, after our pastor's wife passed it along to her as a helpful resource. And I want to do my part in spreading the word about this 2011 release from Iron Sharpeneth Iron Publications, A Ministry of Ironwood Camp in Newberry Springs, California. 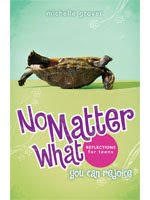 The book is Hope for a Mom's Heart by Merri Ellen Wright. And it is a refreshing spring, a heart-to-heart with a woman who loves and understands graciously. Merri Ellen looks forward to the reunion with her Savior and three precious children who got to see Him face to face before she did. 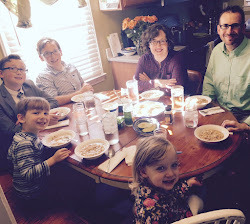 She is a pastor's wife who makes her home in Utah with her husband and four other children. Merri Ellen, picture courtesy of her daughter via facebook. Doesn't she just look like a person we'd be friends with? Beginning with a tender presentation of the gospel, Merri Ellen then broaches the subject of loss, sharing Scripture and personal testimony as she gently shepherds the reader through the stages of grief and healing. I was so thankful that she ventured beyond a mother's grief to the grief of the father and the family--siblings, grandparents--and others. Talking openly with our kids--crying together, praying together, looking forward to heaven together--as they've wanted to and needed to, has given us a family bond that we would not have had otherwise. Merri Ellen tastefully offers spiritual truth as well as practical suggestions for "going on," including ideas for making a memorial for your child. I loved this, because she included several of the things we have done, things that have been particularly helpful to us as a family, in her list. Their family planted a tree on the church property for each of the three children they lost. After a woman in our church was killed in a car accident along with her child and unborn child, the family made a memorial garden complete with a beautiful waterfall and reflection bench. It's absolutely beautiful. I personally wanted something that blooms in February, something fragrant and uplifting for the annual remembrance of our little rosebud, Kali Grace. 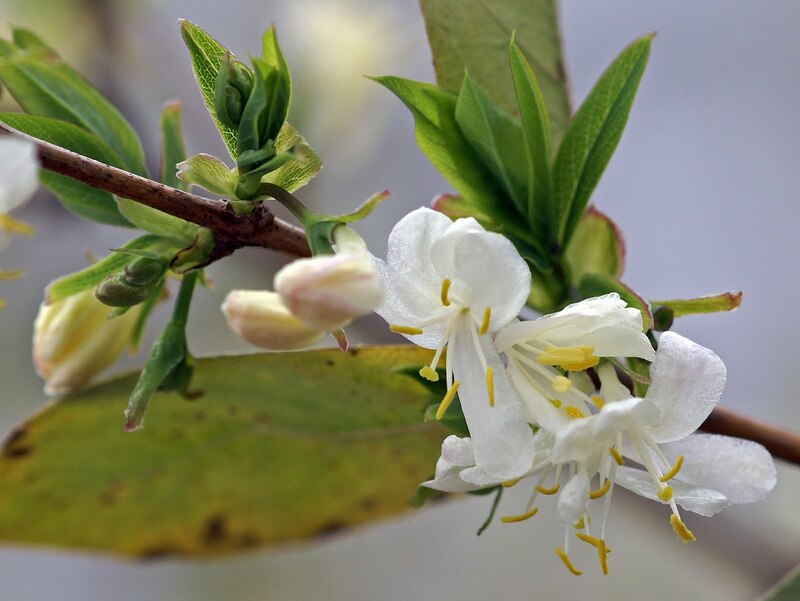 We call it our "Kali bush," but it's actually a winter bush honeysuckle (or, Lonicera fragrantissima). There is nothing so sweet in February, and I'm thankful both for my gardening friend, Mrs. Shaffer, who had a shoot to share in the spring of 2008. I remember not wanting to cut it back at first but was then reminded of the beauty of pruning and how painful things produce fruit. And even tonight I was out there with the clippers, shaping up our Kali bush, anxiously awaiting the fragrantissima of this memorial planting. Mother's Day 2008, Alan bought me this beautiful painting, Under His Wings, by our friend Ron DiCianni. For a while it hung in our room but has found its home in the nursery with fresh green walls and blue & white accents. It reminds me of His whisper on that fateful day in February: "It's okay, Michelle. I have her." And it is okay. In fact, I can honestly say that I would rather have held her in my womb for sixteen weeks, to know that there is a precious little girl in our family tree, and that she is with her Father in heaven, doing what I long to do: praising Him perfectly. Merri Ellen mentions this precious thought too, in the chapter called "Your Child Now." And we started last year to make a donation "In Loving Memory of Kali Grace" to Piedmont Women's Center. There was nothing that could've been done to prevent the homegoing of our baby with Trisomy 18, but there is much to be done to prevent the early death of many unborn. You can read more about Kali Grace under the label "rosebud." 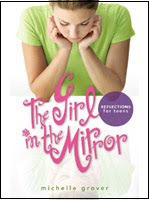 After an encouraging chapter on helping others who are going through the loss of a child, she shares vignettes of others' stories that helped her realize that she was not alone, that others do understand her grief and feelings. Absolutely, we each have a unique story, unique details, but if we think we're the only one who has ever ... we're shutting out a unique bond of other sisters in Christ who we have for mutual encouragement. I know for me, one of the most healing things for me personally was following through with Nancy Leigh DeMoss's suggestion at the end of each lesson in A Thirty Day Walk with God in the Psalms: praying for someone else. At the end of the book, Merri Ellen offers a plethora of additional helps: collections of hope-filled verses, medical Q&As, symptoms of denial, what not to say, ways to memorialize, prayers to pray, suggestions for husbands in helping their wives. And at the very end of the book, there are pages for you to make it your own, recording your story, verses of hope, letters and prayers, and current thoughts. Thank you, Merri Ellen, for sharing your story, for opening your heart and the Word to us. I feel like we've just had a very good talk and consider you my dear friend. 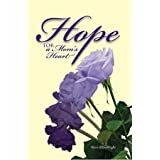 Hope for a Mom's Heart a beautifully written book, a fabulous resource for believers who have gone through miscarriage or the loss of a child by other means, a tasteful gift for a mom whose arms are painfully empty perhaps given along with a meal or a special plant or some jewelry. I hope and pray it will find its niche and meet needs in many a woman's heart. Will you help me spread the word? One simple way: "Like" this book on facebook, by visiting here. We've all had a recipe that didn't quite turn out the way we remembered it from the last time. Just this week I was laughing with my mom about this. She and Dad sat down to enjoy Gramma's recipe for Tuna Pasta Salad. It's tangy and the only dish I actually like radishes in. But something didn't taste quite right. Finally they realized, she'd forgotten to add the tuna. Too funny. With varying responsibilities--being a wife and mother of young children, keeping our home in some semblance of order; piecing together flexible work responsibilities of writing, tutoring, and substitute teaching; staying engaged with the Women for Missions, Inner City, and Children's Ministries at church; and just building relationships--I've got plenty on my plate right now. But it's seemed recently that something wasn't quite right. Well, I just started re-reading John Piper's Let the Nations Be Glad, and what that something was hit me on the very first page. "Missionaries will never call out, 'Let the nations be glad! ', who cannot say from the heart, 'I rejoice in the Lord.... I will be glad and exult in thee, I will sing praise to thy name, O Most High' (Psalm 104:34; 9:2)." In the midst of all the details and duties and devotion, I'm afraid I've left off being sincerely glad. Piper's next sentence is: "Missions begins and ends in worship." And by his third page of text, he's identified at least one plausible reason for lacking joyful worship: "It is possible to be distracted from God in trying to serve God. Martha-like, we neglect the one thing needful, and soon begin to present God as busy and fretful." That one needful thing, the "better part," is sitting at the feet of Jesus. And I think, how have I been presenting God to those I'm serving? To my own children? To those in our 2nd grade Sunday School class? To those in my discussion group in Inner City? To the students I teach? To my own easily-deceived heart? "Busy and fretful"? Or kindly sovereign and worthy of worship? Honestly, I'm convicted. Gladness in Christianity is much deeper than a Pollyanna put-on. It is both an intentional and supernatural attitude. Joy is Spirit-fruit; it grows from a soul planted in God. "In His presence, there is fullness of joy." Have you noticed a lack of joy in your life recently? If so, is that lack reflective of a lack of fellowship with God in His Word and prayer? What is your favorite refresher? A specific psalm or hymn? A prayer? Ron DiCianni's Lord, Teach Us to Pray hangs at the very heart of my house. You'll see it as soon as you walk in my front door, in that hallway connecting nearly all the rooms in our little mill house, a position which is almost actually the center point of our home. It's a reminder to me of my place as "a fruitful vine in the very heart of [our] home" and my calling to be a godly mother to my little "olive shoots," two of whom have been grafted in, one of whom is fourteen months old and absolutely wild, at least if the 150 baggies he pulled out of their box today and threw all over the kitchen floor is any evidence. He's also very sweet and innocent in his pleasures too, though. 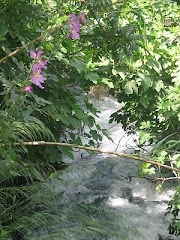 My post today is short and sweet: Lord, teach us to pray, and help us teach them to pray. Alan recently challenged our two older boys to pray for 5 minutes a day. They didn't think they could do it, so he lowered his challenge to 2 minutes, not wanting to discourage them but wanting to whet their appetites for the relationship of prayer. Even at 2 minutes, Jordan was still not sure how in the world...; in fact, he was convinced he couldn't do it. So I asked him to bring his composition notebook (which he repeatedly and adorably calls his compassion notebook and, after attempting to correct him once, I decided I like what he calls it). We opened to the last page so we could always find it quickly. And I wrote out a long list of family names, a few pastors and two missionaries. "Mom, I can pray through that in like 30 seconds." Still not convinced. "I'm done, Mom! Stop the timer." He got the sweetest, biggest grin all over his face and gave me an unsolicited hug. "Thank you, Mommy!" And my heart is huge. Thank You, God. That made my day! Lord, teach me to pray, and teach me to teach my children to pray. May they also teach me to pray, and may we all pray more and more. Do you have a particular method of prayer that helps you stay focused? Please comment below! Have your kids encouraged your heart recently? I'd love to hear about this too! 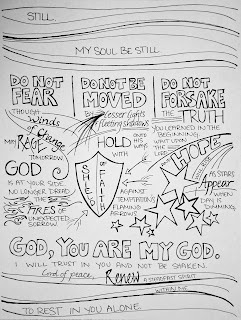 I've been working my way through the Old Testament prophecies of Ezekiel this summer--little bit by little bit--taking comprehension notes (including poignant quotations from my sidearm friend Charles Feinberg) in one column. But then making personal action notes in a second column. Typically I'm several chapters ahead in my devotional read-through as compared to where I'm actually at studying Feinberg's commentary and typing up notes. But this system is working well for me (thankfully), and I feel like I'm digesting it better by reading just the Word first, and then going back to study. Plus, it's so nice to have the chart to look back over. As I started Ezekiel, I immediately felt a connectivity to this thirty-year-old servant of God (1:1). I too am thirty, and God's been kneading into my heart His calling on my life to be His servant. Ezekiel's was a ministry of communicating God's message, both written and spoken, to God's people. And along the way I've jotted down notes regarding communicating: the power of drama to draw in an audience (12:1-16), to illustrate creatively (4:1-8; 12:17-20), to use parables or riddles to peak interest, but then to be sure to clearly explain the analogy (17); that there's a place for repetition, even if it's just because I am overwhelmed with the awesomeness of God's glory (10); and that even my personality is such that God knows will be effective for His purposes for me (3:4-11, God equips to deal with what He is sending His servant to face). Over and over again, the theme of God's awesome glory has surfaced--His all-consuming desire that every individual and nation would truly know who He is. Woven into that theme is the seriousness of sin and its impending consequences, as well as the extended and oft-repeated invitation to mercy. I've been amazed throughout the book as I've seen the two great qualities--truth and mercy--kissing. In 11:1-4, it seems that Jerusalem's elders were counseling self-preservation in the midst of impending doom. This was not God's counsel. The only way to save one's life is to give it up, we're told in the NT. And their only hope, as ours, is repentance and forgiveness of sins. God wins at word-play and turns the wicked counselors' metaphor (about the city being a cauldron and the people, meat) back on them, telling them they'll wish they were meat boiled in a cauldron, but instead they'll be taken out of the pot (the city of Jerusalem)--exiled and slain (11:5-12). In the very midst of this prophecy, God strikes one of the leaders dead. And right in the middle of this speech, Ezekiel is completely overwhelmed, again. Right there and then, Ezekiel gives is our example of how we should respond when overwhelmed by God's message: he falls down and cries out to God. "Ah, Lord God! Will You make a full end of the remnant of Israel?" And God hears the sincere prayer of His servant. After ten and a half chapters, God offers "the first promises of restoration in the book" (Feinburg). And it's a beautiful passage in which God foretells the recalling together of His scattered remnant back to redeem the desecrated land and promises unity, renewal of spirit and a tender heart. How important it is in the darkest of times to look to the Lord and His promises of "hope and a future." And I've got plenty of notes that say, "Study this more." But I've seen ... The importance of being faithful. The individual responsibility of each soul. The necessary purging of rebellion from each heart. The tragedy of others' sins affecting those around them. These are a few of the lessons I've noted. In that same chapter, God promises that "every heart will melt" ( verse 7), just like "every knee shall bow" (Philippians 2). And I would much prefer my heart melting in love and awe of Him than in the fire that will consume. Think ... the difference between fresh-from-the-oven, golden-brown chocolate-chip cookies ... and a renegade chunk of cookie dough, now indistinguishable, fallen to the bottom of the stove, burnt to a crisp. Which do you long for? 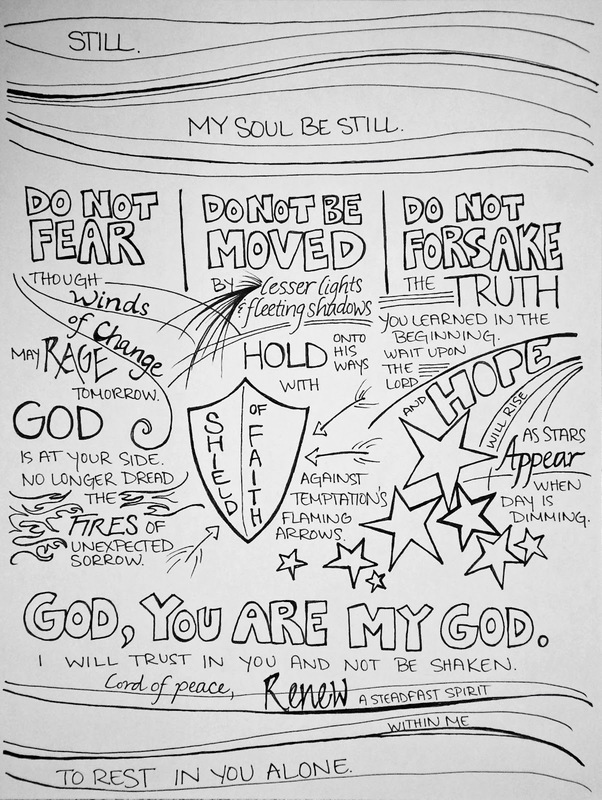 But of all the passages that God has moved my heart with this summer, none has equaled Ezekiel 24:15-27. Perhaps part of it is the timing. We celebrated our tenth wedding anniversary this past week. And turning thirty didn't even phase me. But I ran right into this tenth anniversary milestone as if it were literally a slab of granite. "I've been married a third of my life. Wow." (Yes, that's what happens when you get married at twenty.) And I got contemplative. In the midst of the contemplation, I dug in here. In this passage, Ezekiel's wife dies. Nothing says "Happy Anniversary" like thinking about "till death do us part," right? Ezekiel's wife dies as a symbolic lesson for the people of Israel. God gave him the heads-up, sure. But it wasn't like they got a sabbatical to make their final memories. I'm sure they would have loved that had God given them that opportunity. But instead, he preaches in the morning, and that night, she dies. I wonder if Ezekiel told his wife that she would die soon. I wonder if she knew, if He told her too. But I have no doubt, either way, she was ready. She must have supported and encouraged him through so much. Were they married during that time when he lay on his side for months on end? Did she take his dishes, bring him his portion of "wheat and barley, beans and lentils, millet and spelt" bread? What cruel things were said to her about her husband as he obeyed God, to communicate His message, through what looked to most like mental illness? His was a difficult ministry. And she was "the delight of his eyes." For her life to be extinguished in order for her husband's sermon to hit home--incredible! And we tend to get hung up on his not being permitted to weep. Feinberg notes: "Faced with this directive Ezekiel exhibited complete subordination of his own will and feelings to his prophetic office in the will of God. In spite of the fact that he knew his wife's hours were numbered, he went about the ministry committed to him. What an example of obedience!" But even this was not what gripped me, this time through. As the wife of a man who is committed to serving the Lord in a teaching/preaching ministry, this particular passage sunk deep in my heart. Alan's ministry will no doubt be a difficult one. He's finishing up his PhD in NT with the hope of equipping African nationals to effectively communicate God's Word in their culture. Our heart is to see God's Kingdom advance in that land and around the world. As his wife, will you encourage him even in the darkest times when no one is listening? Will you be "the delight of his eyes?" And the clincher: Are you willing for your life to be extinguished in order for the people to listen to his (My) message? Missions becomes much less romantic, much less an adventure, and much more a surrender of myself to God and a submission to the ministry God has given my husband, when put in these terms. If this is God's purpose, His will, for us ... am I willing to DIE so that my husband's ministry will be more effective? As a corollary, am I willing to LIVE in such a way that my husband's ministry will be more effective (Proverbs 31:23)? Sometimes, this is harder. But as it was, Ezekiel's wife died so that he might preach. His obedience to God got the attention of the people. They knew by this time that his actions meant something for them. And they understood that just as Ezekiel's wife was the "delight of his eyes" so the sanctuary was their "pride [and] delight." That--and their children--the two things most precious to them--would be taken from them, just as Ezekiel's wife was taken from him. And they, in their captivity, would be given no allowance for the customary grieving process or traditions. I have no doubt it was difficult for Ezekiel to carry on without his wife. This prophecy and its initial fulfillment in the death of Ezekiel's wife marked a temporary change in the ministry of Ezekiel. Surely any man's life and ministry changes somewhat when his wife passes on, perhaps especially in a sudden moment with little warning, but I would think regardless of the circumstances. And it appears there is a pause for Ezekiel--a muting of his voice for the interim--until he hears from a messenger that the purpose of his wife's death and the further prophecy of the sanctuary's destruction has been fulfilled. Even after, when he starts preaching again, there's been a transition: his preaching for the next significant chunk of the book is directed toward neighboring nations. And I haven't finished studying, let alone reading, the rest. But I've had plenty to chew on, things hard to swallow. And it's taken me to my knees. But it's been so good, so rich. And I have felt God drawing me closer to Him, purifying my Oholibah-prone heart. I pray that while I live, I will be the kind of wife Alan needs me to be--the rib of his side, the fruitful vine in his home, "the delight of his eyes." And I long for God to use my life--& my death, if He tarries His return--to bring Him glory, to make His message clear to those who need to hear, and to grow His kingdom in our hearts. What passage of Scripture has God been using to melt your heart recently? I'd love to hear from you. Just below "21 Friday" in my Family Planner is marked "Beginning of Ramadan." I don't mind that it's written there. It's a reminder to pray. And it's been on my heart again recently to pray more fervently for our Muslim neighbors. As today starts these days set aside by Muslims for prayer and fasting (and subsequent feasting) known as Ramadan, it seems an appropriate day to encourage one another to pray for the salvation of Muslims around the world as well as in our own country and even our own neighborhoods. And then to engage them in gospel conversations, for their salvation and the glory of God. I read Woman to Woman: Sharing Jesus with a Muslim Friend a couple of years ago now. It was on the stack of books to be reviewed in our campus store, and it got my attention. It's now available for kindle too. You can read my review here, but I definitely plan to read through it again over the next 30 days. Another downloadable resource that has been brought to my attention during this present season is from worldchristian.com. They publish a 30 day prayer guide for Christians wanting to learn more about Islam as well as to pray for Muslims during their Ramadan. They also have a kids' version which I would probably be more likely to go with. Just personally. You know you go for kids' versions too. =) These do have a minimal cost. But there are also more resources available at 30daysprayer.com. And then, Bob Rutledge, over at GFA Missions, has compiled a fabulous collection of resources for engaging our Muslim neighbors in gospel conversations, "equipping Christians to evangelize Muslims." You'll find pamphlets, tracts, books, even a DVD. Let's make it a matter of prayer that God would save our currently Muslim neighbors, that we would have boldness and much fruit in this plentiful harvest. There's something bonding and wonderful about participating in a writing class. Maybe it's the shared passion for words. Maybe it's the opening of your own heart in transparent communication, that opening up that welcomes peer criticism by those whom who must critique as well. I remember touring a replica of James Cook's ship in Australia on holiday with a homeschooling missionary family there. We learned more that day than normal book work. And the tour guide taught us some common cliches' origins. One comes to mind in thinking about critiques: the "you scratch my back, I'll scratch yours" of shipmen threatened with the cat whip, pledging to go easy on one another if either had to be disciplined. Though, like they, we too have to whip at least hard enough to conceal our secret oath from the captain (the teacher), or we can expect discipline ourselves. And many writing teachers do include your ability to critique your own work as well as that of your peers as part of your grade. But I've been thinking a lot about the pleasure and challenge of writing classes recently. As Alan finishes up his PhD (Lord-willing this coming school year, though we know dissertations can stretch longer for men working full time), we've been talking a lot about our next step. Many of you know our long-term thought is to train nationals in Africa, the whole reason Alan's getting the PhD in New Testament being to qualify him for teaching on the seminary level. We agree that one parent working on an advanced degree at a time is more than enough for our household. But I was so thrilled the other night when he encouraged me toward an MFA (Master of Fine Arts) in Creative Nonfiction. The MFA is a terminal degree that allows professorship in a creative field (art, cinematography, writing, e.g. ), often in a low-residency model. The ones I've looked at are typically five 10-to-14 day residencies at a specific location, and then correspondence work throughout four terms. The first four residencies are instruction intensive and provide opportunities for interacting with others in the program, while the fifth is a presentation of your major work. If I were interested in journalism, I'd definitely look into World magazine's Journalism institute (worldji.com). And I'm open to God redirecting, intrigued at their heart to train journalists internationally--first in Africa, currently in India--and then also to place American Christian journalists in international newsrooms. And I love this article on servant journalism--that it's about community and compassion and humility. But for now, my direction seems to be more toward longer works. I'm looking for the right program, interested in the one at Seattle Pacific University. And would love to hear from you if you know of a program that would be scholastically rigorous (though still meaningful). And I would love it if I could find a program whose teachers had the philosophy of writing for a purpose, to communicate truth to the world. My dream? To continue writing and to someday teach writing on the college level. I would love to help train the next generation of Christian communicators. But, having gotten my undergrad in Special Education, I also have a heart to teach remedial writing to those who do not find it easy to express themselves--because I believe writing is difficult for many but that they have a unique perspective that's worth hearing as well; it's just a matter of unlocking it. This dream allows me to marry my love for education and writing. And the MFA seems to be the next logical step in making my dream a reality. We shall see what God does. In the mean time, I picked up Roger Rosenblatt's Unless It Moves the Human Heart: The Craft and Art of Writing. Rosenblatt teaches in an MFA program on Long Island, NY. And reading his book is participating in one of his writing classes. He thoroughly acquaints you with different types of writers in the student characters in his book. But he also shares insights on teaching writing: these passages were my favorites. Here are a few of the passages that stood out to me, and I share them here (since I have to return the book to the library soon and want to be able to review them) and because some of you will enjoy them too, maybe even be interested in picking up a copy for yourself. He talked about trying to imitate someone else's teaching style and how it was an abominable failure. And, I think, he is not just writing for people who want to write but also for people who do write and who teach writing. This passage could be subtitled "The Power of Praise and a Proper Posture in Critique." I'm sure my style will not be entirely identical to his, but I think I could handle his. This is good advice for all teachers, not just teachers of writing. Yours is a powerful role. And parents, you are teachers, whether you have a degree in education or no. Take seriously this daunting burden. But I will add too, as a caution to writers, there comes a time when the editor says no more, the page is set, and it's too costly to revise: make sure you are completely satisfied with your writing before you send it to the editor. And I remember going to lunch with Mrs. Jamie Langston Turner, my Creative Writing and Poetry Writing teacher at Universtiy. We went to Scholtzsky's on Wade Hampton in what I now realize was the early stages of my novel, though I specifically remember telling her I thought I could finish it in the next week or so. I marvel at my faith (optimism?) sometimes. She was writing a multiple perspective novel too and asked me how I was handling the multiple perspectives. I distinctly remember being awed at that. But it is as we give others that respect, granting that their insights are significant, that we build them up into what they are becoming. I have felt this way, helped along by others' writing styles, how they successfully reach their audience. But actually, this is how I feel about reading my Bible and its Author. I mentioned in an earlier post how maintaining a devotional walk with God makes all the difference in my writing. And I almost always write with my Bible by my side (or a tab with biblegateway.org opened). Reread this quote with God in mind and you'll know how I feel. Interestingly, WJI (mentioned earlier) recommends those interested in journalism not major in journalism but major in something else. See their answer to the FAQ: "Should one major in journalism in college?" And there is nothing worse than wondering what you would've written if it were really what was in your heart and not just what you thought other people wanted to read. See why I felt like I was sitting in one of Roger Rosenblatt's classes? This book was presented in such an enjoyable format and, as you can see, had some great nuggets of instruction for writing, teaching, and life. Review: Loved it. His background's obviously different from mine, his perspective unique, but I felt very much as though he'd found his voice. And I believe I have benefited from reading his book. So, what books have you enjoyed recently? What is your dream? Are you on the path toward it? And, if you hear of a fabulous MFA Creative Nonfiction program, let me know that too. may God give peace and grace.